Note: 6 months: One of only two lines in the nursery containing this species, and for both line 010 and this one we can see quite a high mortality rate. The reason for this is 'white syndrome', a coral disease which seems particularly prevalent in this and other fast growing species. 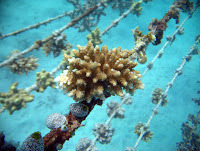 It is possible the fast growing coral species have a trade off between immune system strength and growth rate. Their ability to cope with disease may be drastically decreased due to more energy being put into skeletal extension. 2 year update: Unfortunately this species was one of the most hard hit during the El Nino induced bleaching event in 2016. On the reef, this species was almost wiped out locally, and in the nursery it fared very poorly. You will see from the 2 year image below that most of your colonies died, however there are parts that survived (see right). These will be used to plant new lines and will hopefully spawn, producing new genetic material which is as resilient as they were during the bleaching event. You will notice the living parts are underneath the line- this is because they were shaded when bleached. Whilst bleached, corals lose some of their protection from harmful UV - We expect it was the intense sunlight whilst bleaching occurred that caused the mortality for the rest of the line. This is useful information for us, because we know now that shading the nursery more effectively during bleaching periods could save a lot of coral. Luckily, this is a fast growing species, so we hope to see recovery quite quickly. For more information visit our bleaching page. 2 year update: We can see from the picture, that a few of the colonies in the foreground died- this was caused by the El Nino induced bleaching event in 2016. To learn more about the bleaching head to our bleaching page. 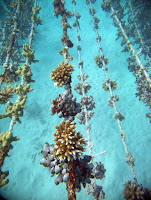 Having lost over 80% of coral on our house reef, to lose just a few colonies on this line was great. 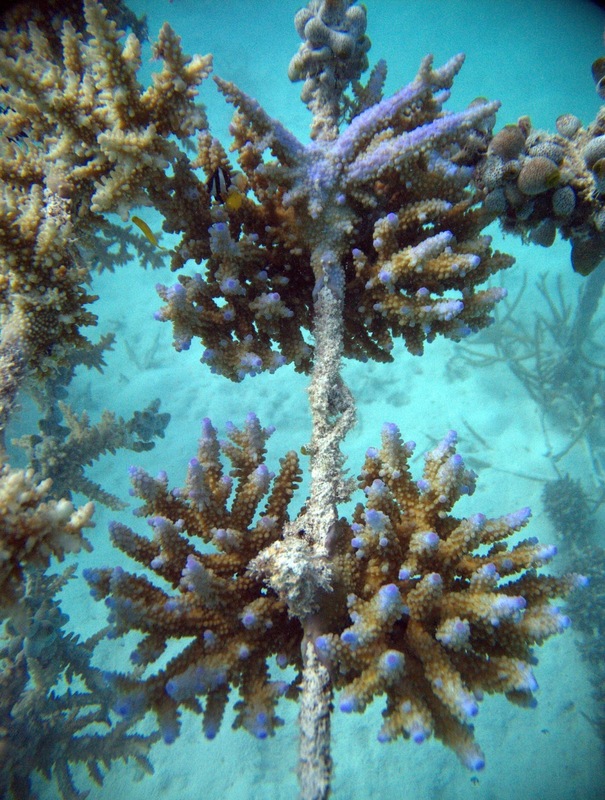 The majority of the line survived well and will be incredibly important for recovering our damaged reef. The lines were left in the nursery during the warming period so as not to induce any extra stress. 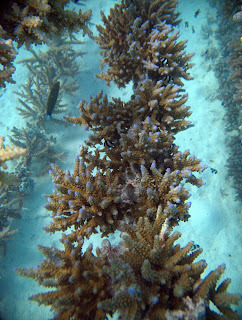 Note: An incredibly beautiful coral with bright purple tips, this one is growing at a growth rate of 15mm per quarter and has a survival rate of 68%. It is strange that the first 31 fragments in the line are all alive and healthy, whereas 18 out of the last 25 fragments have unfortunately died. The line became infected by white syndrome- a coral disease- and this is likely the cause of most of the mortality. Since then, the line has stabalised and is growing really well! 2 year update: Whilst i have not been able to update your graph (coming soon!!) I am so happy to report that this is still an excellent line! During the El nino induced bleaching event of 2016, we lost more than 80% of the coral on our house reef. We made the decision to leave the lines in the nursery so as not to induce any extra stress on the colonies during this delicate time. We moved the lines a little deeper, as you can probably tell from the picture. As a result, you will see that the more shallow (therefore warmer) ends of the lines actually died, whereas the middle parts (deeper and cooler) fared much better. Your survival rate will have dropped again by a little, but the colonies that are still alive are growing beautifully. See right for a few photos. It is interesting to compare your line with line 025, which is of the same species and suffered from the same disease, but completely bleached and died. Your line is now the only place I have seen this species alive in the local area since the bleaching event, so these colonies are very important to re-seed our damaged reef. 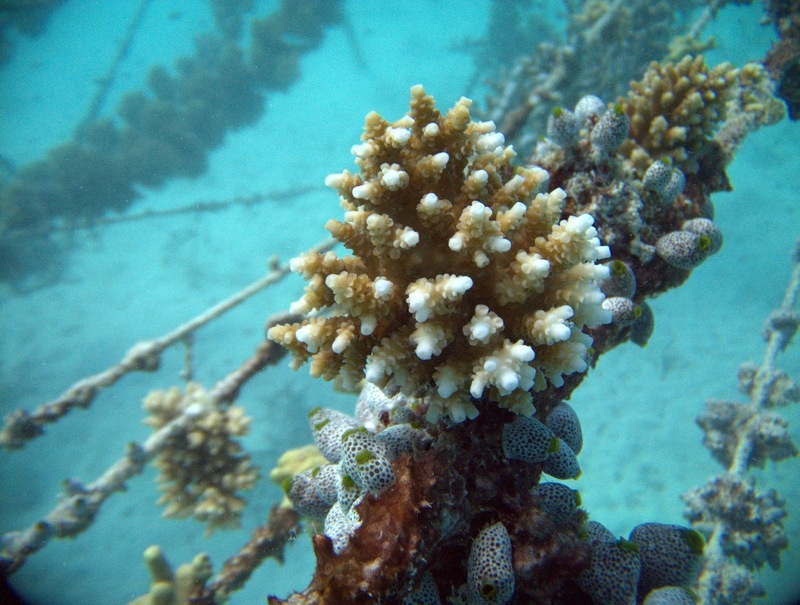 We hope they will spawn soon, providing new genetic material that we hope will possess the same resilience that this genotype clearly has against warming events- making for a stronger reef in the future! 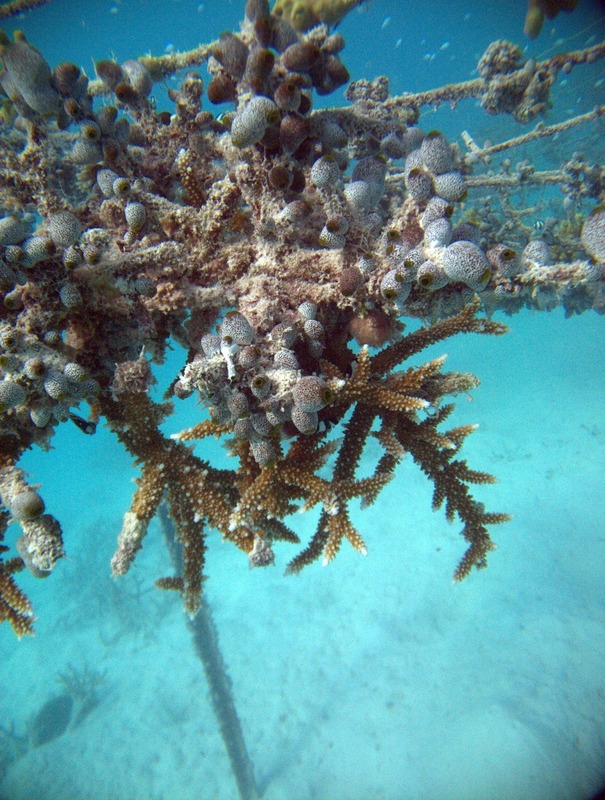 Some colonies from your line were sent to the Four Seasons resort at Kuda Huraa to kick start their re-growth program as they had no Acropora nasuta at all. 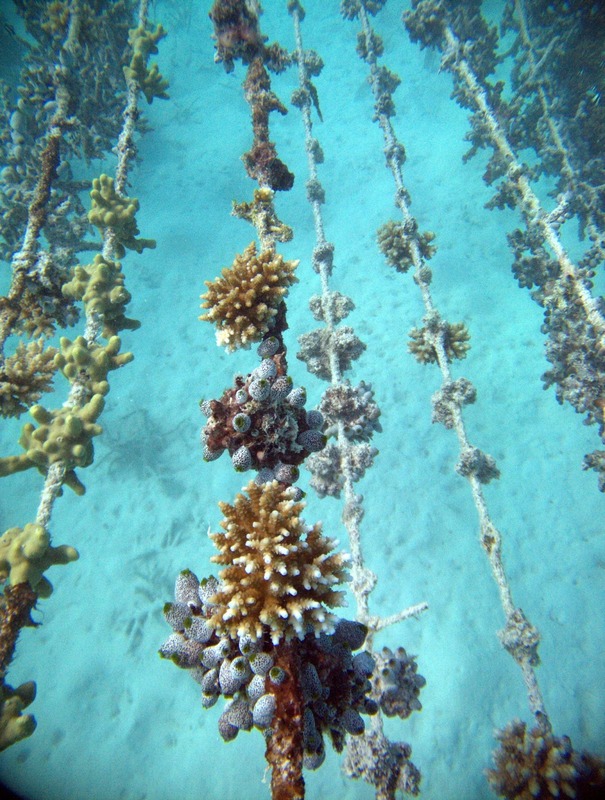 Message: "Please help Vaidas build the coral at Gili "
On the photograph depicting the line at 9 months, you will notice 2 white corals. 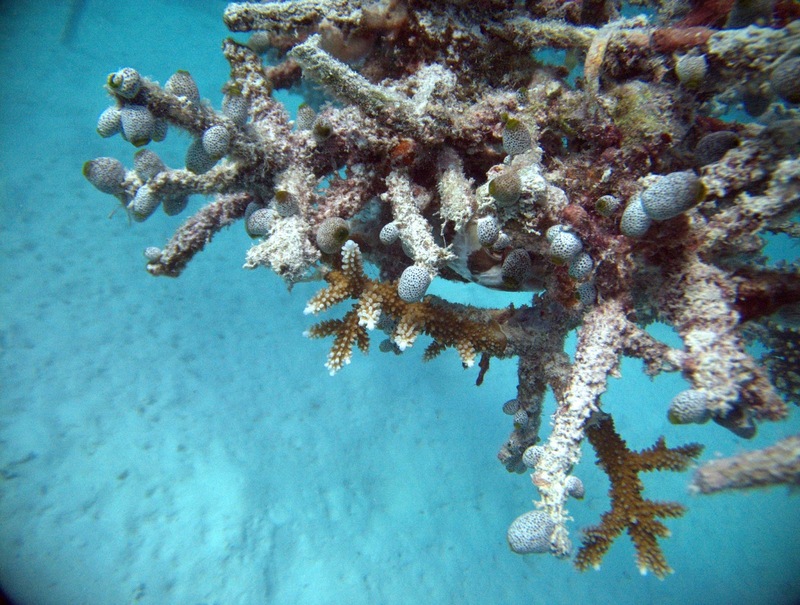 We know these are both recently dead because we can see the bright white calcium carbonate skeleton which grows beneath the brown coral tissue. 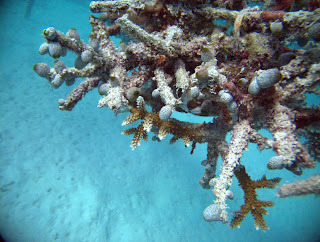 The cause of death is unknown, but because no algae has started to grow on the skeleton yet, we know the entire colony died at the same time, this was not gradual mortality. Possibly caused by bleaching due to an unknown stress factor.